It was a holiday weekend and traffic was heavy. We had no desire to join the rush up I-65 toward Louisville. Plus we didn't need to be home until noon the following day. “Let's go up 31E to the Blue Grass Parkway and cut over to Lexington,” suggested Lynn. We had driven US-31E in the past and it was a pleasant drive. Sunshine and blue sky with temperature in the 80s, it was a beautiful day and the drive was hilly and quite pleasant. Sticking to the “blue highways” is always less stressful and far more interesting than interstates. We passed many signs for the various distilleries on the Bourbon Trail along the way, including a few we had never heard of. As we approached Hodgenville, there were signs for the Lincoln's birthplace and also a museum. We had each visited Lincoln's birthplace in the distant past. But a newer sign caught our eye – Lincoln's Boyhood Home. It was lunchtime and the new park was right on 31E. We stopped for a leisurely lunch in the parking lot. Then we checked the place out (free). There were numerous signs with historical information about the area, Lincoln's life there as a boy, his brother Thomas, and the subsequent events. Lincoln himself wrote that “My earliest recollection, however, is of the Knob Creek place.” His family had leased a farm on Knob Creek after leaving the Sinking Spring farm (Lincoln's birthplace) because of an unstable land title. It was here Abraham learned farm chores, first went to school, nearly drowned in the creek, and his baby brother was born and died. His family moved on to Indiana when he was seven years old. On the site there is a reconstructed cabin similar to what Lincoln's family would have lived in and a historic 1928 log tavern that was built on the site (and will someday hopefully become a museum.) 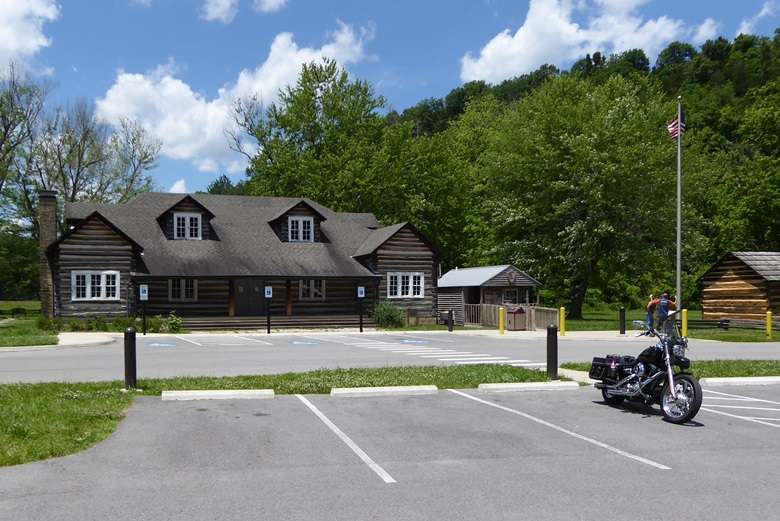 The tavern had been a stop over on the “Lincoln Trail,” selling refreshments and gas, as well as a gathering places for both locals and tourists. It's not open now. There were hiking trails along the creek and to the top of one of the knobs, a great view. The National Park Service assumed management in 2001 and manages it along with the Lincoln Birthplace site south of Hodgenville, KY. It was a worthwhile lunch stop, and offers some pleasant hiking during a longer visit.